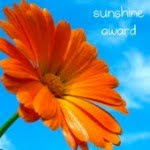 Then on May 17 00dozo at When I Reach also gave me a Sunshine Award in her post But, Why Me?? I'm Just a Lowly Rookie! Both of these blogger buddies said they admired me for keeping my sense of humour throughout my recent medical malady (that cancer treatment thingy). You may have noticed I was away for close to a month. Yep. But I'm back and things are getting better everyday. I'm writing a couple of posts a week down, certainly, from my post a day. So in the coming months my output will be down from what it used to be and I may cut back on the number of blogs I maintain. We'll see. I want to thank everyone for their e-mails, Tweets, Facebook messages and comments on my blog both before my procedure and after. Some were very funny, others expressed concern, all were heartfelt and much appreciated. And thanks to Frank and 00dozo for their sweet awards - thanks guys. Now these awards come with certain conditions but screw that, I'm falling back on not being at full strength and thus am unable to carry those conditions out. Instead, to all my loyal readers, commenters and drive-bys, I'm sending this out to you! Nobody does Sunshine like you, Dufus! I'm so glad you're back! CL: Thank you ma'am. Believe me it's good to be back. Quirks: When I think of sunshine, I always think of that song. Glad you enjoyed it. I was hesitant to use the "funnybone" reference in my post because I didn't know what kind of cancer you have (had?) - but I did look it up in your archives. Glad I didn't put my foot in my mouth. 00dozo: You were bang on. Multiple Myeloma is a cancer of the bone marrow. I deeply appreciate you passing along this award to me. It was a very kind gesture. Thanks. Oh, dozo is me! I did forget to thank you for your nice comment in your post - and comment - and you are absolutely welcome! Um, but just between you and me, I was (hopefully) not referring to a different "bone", if you catch my drift? I usually get it right about half the time by accident. I haven't heard that song in forever! Now I can't get it out of my head - but in a good way! Congratulations on the award! Nicky: Yeah, it's a great song. And thanks. Leeuna: Woo-hoo, another award? I'll be right there! I don't remember if I told you, but my mother has Multiple Myeloma. She has been in and out of remission for about two years. We made a trip to MD Anderson to test for stem cell transplant, but made the decision not to go ahead with the procedure due to the fact that Mom will be 80 this year. However, she is doing quite well! She can still work circles around me! I am so glad that you are through with your procedure and hope your health returns very soon! Malisa: I'm glad to hear your mom's doing well. Myeloma can really wear a person down. My transplant was preceded by a new "targeted" radiation program. I was the second person in Canada to undergo such a procedure apparently. And the docs are thrilled with my progress. So, here's hoping we keep the big "C" away for some time.